Sonic manipulation is the cornerstone of Dillon Nathaniel's unconventional approach to house music. In just a few short years the graduate of the revered Icon Collective and self professed gear junkie has proven himself to be a technical mastermind and modern house music connoisseur. The strength of his thick low-end grooves and quirky sound design have caught. the ears of A-Track, AC Slater, Destructo, Chris Lake, Malaa and Tchami. His sound has also begun to inject itself onto the ears of mainstream audiences with plays popping up from BBC Radio 1, Rinse FM and Sirius. And with appearances on Night Bass, Confession, This Ain't Bristol, Main Course, Audiophile and Perfect Driver it's clear his intent to ''Shake up people's p ere e pt ion of what house is'' is we 11 with i n reach . While it may seem like this young bass technician has seen a quick rise, his roots run deep. The former audio engineer and gear junkie found his footing in music at an early age as a vocalist and guitar player. His father hoped to impress upon him a strong emphasis in dance music exposing the budding musician to the likes of Carl Cox and Sasha on road trips from the age of 8. He eventually brought Dillon to EDC at the age of 16. It was this that provided the ultimate inspiration to pursue a career in dance music. His ability to construct a mood extends well beyond the studio into his dynamic and energetic DJ sets . He's flexed the subs throughout the country bringing his unique sound to Avalon Hollywood, Exchange LA, Webster Hall (NYC) and Insomniac Event's Escape Psycho Circus. 2018 has already been shaping up to be Dillon Nathaniel's most significat year. After coming off a massive run of shows supporting Destructo on his Lets Be Friends Tour, Dillon will be embarking on his first ever international tour in Australia; . playing at historic clubs like Sydney's Chinese Laundry and Brisbane's . the Met to name a few. 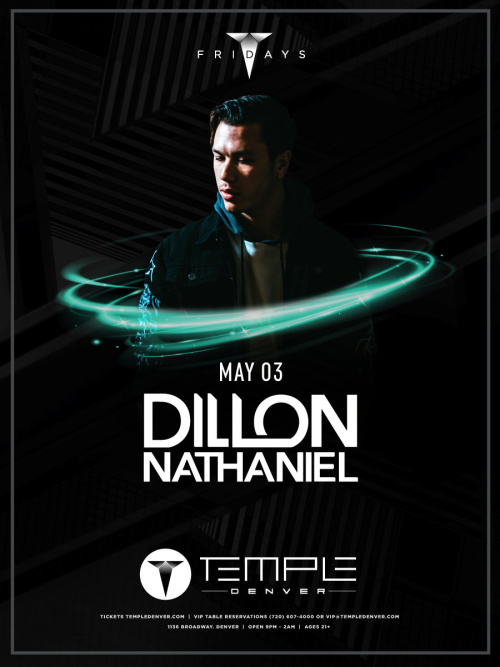 There is no doubt that Dillon will continue to turn heads as he pushes forward in his effort to reshape the face of modern dance music.